Images of 1000 Rs Note New Indian Currency: A fresh picture of Rs. 1000 note is doing rounds on social media, and no one has any idea whether it’s real or fake. Last Month, Prime Minister of India, Narendra Modi discontinued all old currency notes in the country. As the effect of same new notes of 2000 and 500 yrs were introduced to counter the shortage. The government officially presented the 2000 Rs note and 500 rs note, but no official announcement comes regarding Rs. 1000 note. This had changed the things a lot as people were needed to use 2000 note instead of 1000 one. Same had increased the use of 100 rs note as there is a supply shortage of currency valued 500 rupees. To counter the same, Govt was expected to release new money of 1000 rs to fight the difficult situations. Before the release of two thousand rupees, the pictures of the same started doing rounds on the social media. Same been observed with the high-value currency of one thousand. 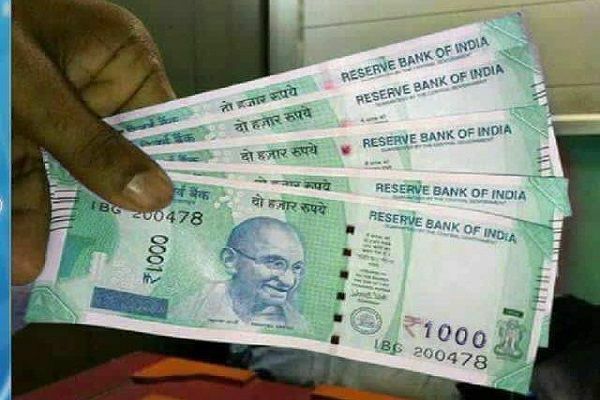 A fresh image went viral on Facebook and Twitter claiming it to be the new currency to be introduced by Modi govt. The new notes of 1000 Rs, as shown in the picture seems to quite similar as of two thousand rupees. They are green. The number of the new currency shown as “1BG 200478”. It’s claimed that the new note is scheduled to release mid of the January. Moreover according to the experts, the series “1BG” belongs to 2000 rs note and it’s definitely a photoshop. RBI hadn’t released any circular regarding the release of new Rs. 1000 note and it’s expected that the government is in no mood of introducing the same at any earlier stage. Better the new 1000 notes are released on the New year’s day, after expiry of time for old notes. All will welcome with joy and pride. If we see closely it’s written 2000 in words and 1000 in digits. It’s fake news.